The campaign for Israel’s 19th Knesset on 22 January is coming to a close. 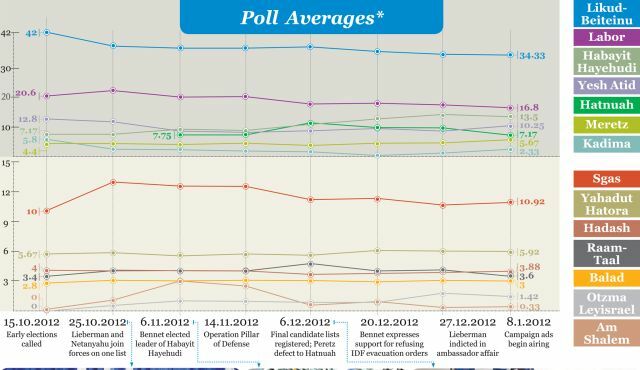 The recent polls show Premier Netanyahu (Likud/Beiteinu) averaging slightly above 34 seats, Labor with 16.5, Habayit Hayehudi with 13.5, Shas with 11, Hatnuah with 7, Meretz with 6 and Kadima with 2.5 seats. Knesset has 120 members. No matter who "wins" the Zionist land theives selection, their turkey is cooked strategically in the long run and millions of emboldened Jihadis are coming after the Zionist terror tourists in Ocuupied Palestine, thanks to US and NATO "democracy" destabilization program which is yielding wonderful "democratic" Salafi Jihadis in the region. The events in Algeria, Mali, Somalia, Libya and most of sub-Saharan and Sahel Africa are a harbinger of future "democratic" trends in the region. The Zionists better start packing their bags for the return journey home because the Jihadi cat is out of the bag and really scrathing away. Allah Abkar and Kalashnikov "democracy" coming to a neighbourhood near you.LOL. How come they let so many people in this election? Have these people been properly svetted by the Israeli government? Thanks for your help here from this blog. Kudos to Iran for allowing fair & balanced elections for all! You show your naivety by claiming Iran allows "fair and balanced elections for all". Why the president Us.... and other authors are so obsessed with the Zionist's issues ? It is not important for Iran whether the Zionists will elect someone or do that or other way. Their mentality of superiority and separatism can only lead; in the long run, to a kind of tragedy that had happened in the 1978 in Jonestown in Guyana. In that case group of fanatical leaders, led population to "eternal salvation" by the application of poisons. Then here are groups of fanatical leaders who believe that the possesion of nuclear weapons and the existence by a force will bring them an eternal security". Since B.M.A. knows better a history, I would suggest and ask him to discover and find a geneological connection of families of president Uskowi and other authors of this blog to any Jewish ancestors.